Prime Location, Rummeligt, Stilfuldt Hus, Sunny Yard, Poolvarme inkluderet. Privat, Luxe, Mountain View House med Casita og rummelige udendørs områder. Vi har designet Biskrahuset til at være det sommerhus, vi gerne vil leje. Fra de premium økologiske badeprodukter til de komfortable udendørs møbler stræber vi efter at give alle hjemmets bekvemmeligheder og så nogle. Der er masser af plads til familie og venner at samle med en åben grundplan og rummelige delte rum, mens de luksuriøse værelser giver rolige private retreater. Splash rundt i den store, opvarmede pool eller lounge i dit valg af sol eller skygge på stuen stil møbler. Efter solnedgang er der ingen grund til at gå ind. Skyl dig op under et tæppe og saml rundt i ildgrubet for en chat og en stjerne stirrer. Alle værelser har wifi, fladskærms-tv med streaming-tjenester og live-tv, HBO og Showtime samt rummelige badeværelser med økologiske badeprodukter. De omfatter også mørklægningsgardiner og latterligt komfortable senge til dem af os, der finder en god nats søvn for at være det ultimative inden for luksus. Det veludstyrede køkken er perfekt til at indhente, mens du laver mad eller shak en cocktail, og der er masser af siddepladser, der serverer mad og service til både indendørs og udendørs spisning. Hvis du kan mønstre entusiasmen for at forlade komforten i Biskra House, er der masser at gøre. Kan du lide at spise, shoppe, golf, tennis eller vandre? Foretrækker en scootertur, kasinoaften eller koncert? Disse er blot et par af områdets attraktioner - kontakt os i dag, så vi kan hjælpe dig med at planlægge den perfekte ferie. City of Rancho MirageTOT Certifikat # 1360. I came down with my wife and three couples from Canada for golf week. The house, property manager and central location was all perfect. We would recommend it most highly and would love to return next year. There are too many superlatives to type. The Biskra House simply exceeded all of our expectations. While the weather was a bit cold for our liking, it did give us an excuse to spend more time indoors. We were able to spread-out in this house without feeling "cooped-up". We all had our own separate spaces to enjoy. The casita was perfect for my parents to have their own "home-within-a-home" yet still be part of the fun. We had 5 adults and 2 children, this house was perfect. The rooms, the pool and all the amenities it was wonderful. The house was fabulous; the owners were attentive; everything was exactly as depicted; perfection! From the minute we were in touch with the owners, the process was very smooth. The house was beautifully decorated, spacious, comfortable and equipped with all state of the art features. The kitchen had everything we could have ever needed. The pool, jacuzzi, outdoor living space and casita were enjoyed by the whole family each afternoon. We loved spending this week in the desert and really hope to be able to return soon. Have you ever traveled to a fancy boutique hotel and been impressed by the attention to detail and quality throughout? Now imagine renting four of those rooms at the same time, having your own private pool and hot tub, and cinema-quality large screen TV and you will start getting close to the amenities offered at this house. As has been described in other reviews, this house is fully stocked with all of the essentials you’d need for a long weekend or a week. The home is immaculate with professional-grade appliances including the washer and drier. Plush robes await you in all of the spacious bathrooms and each room has individually controlled air conditioners and blackout curtains. The mattresses are the perfect balance between soft and firm and the pillows are plush. We made excellent use of the pool, hot tub, propane grill, fire pit and outdoor sectional furniture and our children made s’mores. The house offers plenty of towels (both pool and bath) and has sun block on hand for warding off the desert sun. The kitchen has all of the utensils and spices you might need when preparing meals in and has plastic plates and cups for outside use. All cabinets are labeled as to contents so you don’t spend unnecessary time finding what you are looking for. Multiple restaurants are nearby including the family and wallet friendly Old Spaghetti Factory. There’s a bonus room/game room with an awesome foosball table and the WiFi connection had great reception throughout the property. It is abundantly clear that Beth takes great pride in ownership and values the guests that reside in her home. 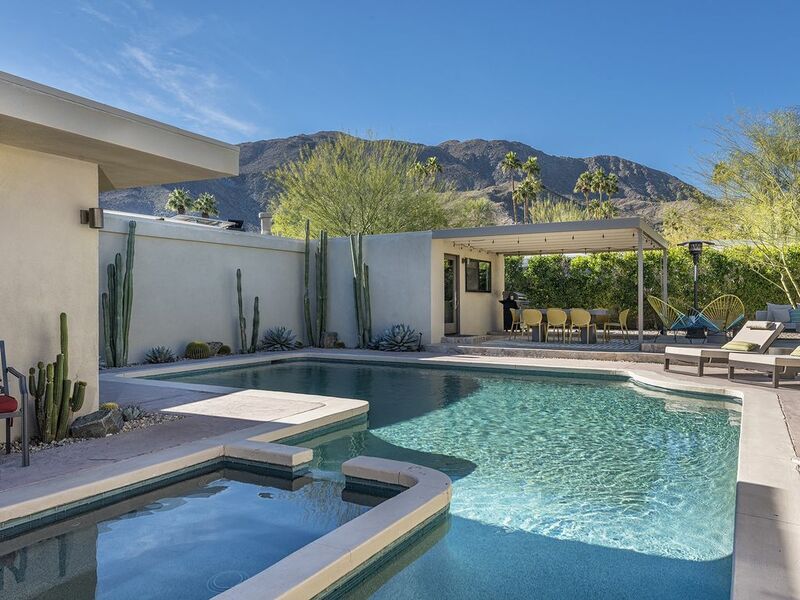 We will definitely return to this home the next time we visit Palm Springs and my wife is planning to return with friends for a long girls weekend. I spent multiple hours searching AirBnB, HomeAway, VRBO, and craigslist and this house by far exceeded the runners up in terms of value for the money. You will not be disappointed. This property was perfect for our family get-away with adult kids! Each couple had their own space - each of which was perfectly appointed. The house is immaculate and has everything you would want on vacation. If you are a cook the kitchen is amazing! The outdoor space kept us all entertained - the spa, the pool, the fire table. We had fantastic meals eating outside while enjoying the beautiful scenery. The neighborhood is super quiet which was perfect for us. The home electronics were first rate. The individual AC controls for each room worked great for our group - they allow for each room to be as cool as you might want. We have stayed in multiple VRBO properties and we all agreed that this was the best yet! Thank you to the owners for all the little details - dog bowls and treats for our little dog were so sweet. Having a big birthday balloon for our son's celebration was so incredibly thoughtful. We will hope to return to celebrate more family events! We can't recommend this property highly enough - it's beyond a five star! Vi er beliggende i den smukke Magnesia Falls Cove kvarter Rancho Mirage, beliggende ved foden af ​​San Jacinto bjergene. Vi har stor vandreture lige ud foran døren, The River indkøbscenter i gåafstand, og El Paseo indkøbscenter kun en kort køretur væk. Palm Springs er kun 20 minutter væk. All pets must be approved by owner prior to booking. Pool heat INCLUDED in all rates. One week minimum stays during March-April peak season. $500 fee for canceled reservations for 15+ night stays. Daily or weekly cleaning can be arranged for an additional fee. Rates subject to change until reservation is made. No dates held without contract and payment.